Animal Images In Prehistoric Rock Art: Looking Beyond Europe : 13.7: Cosmos And Culture Animals are depicted in rock art in more than 100 countries, not just in the famous "painted caves" of Europe. Barbara J. King talks to an archaeologist with a global view of human meaning-making. This June 2008 photo shows an ancient Aboriginal rock carving in the Burrup Peninsula in the north of Western Australia. Rock art images of bulls, bison, horses, lions, rhinoceros, and other animals from caves like Lascaux and Chauvet in France and Altamira in Spain have become popular icons showcasing the antiquity of human-animal relationships, as well as human creativity. Recent finds in two rock shelters in France of engraved aurochs, ibex, horse and mammoth dated to 38,000 years ago — longer ago than the images in the caves — underscore the long tradition of artistic representation of animals on that continent. But the geographic breadth and imaginative richness of faunal rock art is much greater than what is found only in Europe — a fact brought home by reading a chapter by archaeologist Iain Davidson, an emeritus professor at Australia's University of New England, in the forthcoming edited volume Oxford Handbook of the Archaeology and Anthropology of Rock Art. Animal images, Davidson writes, are "the most abundant of all images made on rock surfaces around the world, occurring in more than 100 countries." Animals have mattered to us as people and as artists deeply, for many millennia and right across the globe. "One of the things I am adamant about," Davidson told me via email, "is that the impression that European cave art is the beginning of anything is a wrong impression. It is not as early as art in Sulawesi, and probably in Australia, [and] the evidence from South Africa is compelling that paint making and mark making appeared much earlier there than anywhere." In Sulawesi, Indonesia, people made hand-stencil marks at 39,900 years ago, and depicted a type of pig called the babirusa at around 35,000. Recent evidence suggests the peopling of Australia may have happened as long ago as 65,000 years, meaning that archaeologists may well find quite old dates for faunal rock art there. As it is, the oldest securely dated rock art (at least according to some experts, as some of these dates are quite vigorously debated within archaeology) in Australia — a charcoal drawing at the site of Nawarla Gabarnmang dated to 28,000 years ago — does not depict an animal. 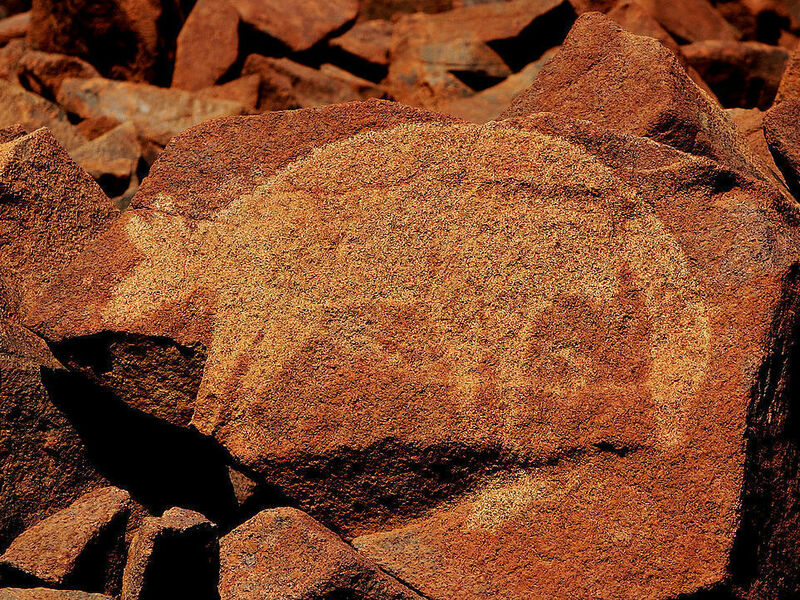 Animal images, including fish, turtles, emu, wallabies, dingoes, and crocodiles, are widely found in Australian rock art, but more recently than that. And in South Africa at a site called Blombos, a discovery of a prehistoric paint factory rocked the world of paleoanthropology because of its date: around 100,000 years ago. Davidson's main focus, as he put it to me, is "the interpretation of rock art in spatial and chronological sets." One fascinating conclusion he reaches is that contrary to traditional interpretation, there may indeed be, in rare instances, "landscape" represented in rock art. "Landscape" here is taken to mean the artists' depiction of some environmental features in rock art — sometimes including animals themselves and sometimes not. The possibilities range from huts depicted at a rock art site in Spain — the kind in which fisher-hunter-gatherer peoples would have lived — to a depiction of a volcanic eruption at Chauvet Cave in France, to geometric marks in Australian sand paintings such as a circle that might represent anything from a circle or hole to a yam or a dog. Davidson isn't arguing for straightforward representational art here or, indeed, for definite interpretations of any kind; he means, instead, to ask rock-art scholars to consider that "it might be worth looking again" at the possibility of landscapes. In fact, another big emphasis in the article is precisely the difficulty of coming to rock images today and trying to decide what they may have meant in long-ago cultural context. "Any meaning of a particular image," Davidson writes, "other than its form or resemblance to something identifiable, was lost the moment the convention within which it was created was lost or changed." I think this lesson is perhaps harder to grasp than it might first appear. When we gaze at paintings or sculpture in a present-day art museum, we're taught, yes, to think about what we see in terms of the artistic conventions of the day — but often we have written, historical context to help us, and sometimes the artist's own words. Those aids to interpretation are often absent with faunal rock art. Consider the rock art from Arnhem Land, Australia known as the Dynamic Figure emu hunt, in which a male human figure is depicted stalking and spearing an emu. "It is even possible that a scene purporting to represent a man hunting an emu is actually a representation of a conflict between a man and a member of another social group with a symbolic association with emus." "I invented the 'violence' hypothesis for the emu scene to draw attention to the need to acknowledge that, whatever else we know, we know that the images on rocks are symbolic." In other words, he intends here something of a thought experiment rather than an attempt at deep interpretation of the man-and-emu scene. Yet the outcome of that experiment is important: We cannot rightly impose our own culture-bound interpretations on symbolic creations when the artists are not here to guide us. One thing is certain, from talking with Davidson: Rock art these days is in trouble and in need of protection. Davidson's recent focus is on the impact of industrial development on large rock art assemblages, so that he visits places in Australia such as Burrup Peninsula, now known as Murujuga and, here in the United States, Utah's Nine Mile Canyon, both of which contain, he says, "some of the most remarkable images and groups of images." "My question is," Davidson said, "how do we convince the world that these images are sufficiently important that industry will not contemplate contributing to their destruction?" It's the right question, and I would underscore that it holds true as much for the United States as it does for, say, Australia. In last Sunday's The New York Times travel section, Stephen Nash wrote about the Bears Ears National Monument in Utah, an area rich with Native American archaeological sites, some of which include rock art. Nash describes the growing threat to this region under the Trump administration. Rock art is a thrilling part of our species' evolutionary history, and of indigenous peoples' cultural history. Even when the meaning of the animal images remain unknowable to us, those images move us with their beauty and with the questions they raise about a diversity of human ways of looking at the natural world. Across the globe, rock art and its animal images deserve our notice and our protection.